This spacious 4 bedroom property ( 5 minute walk to famous Horseshoe Bay Beach on private path) with lovely large private pool and garden is ideally located on the grounds of the Fairmont Southampton Hotel, enjoying a commanding presence and stunning panoramic views of the world-famous Horseshoe Bay Beach! Enjoy these incomparable views and listen to the sound of the surf as it gently laps the beach from anywhere on the property but especially from outside on the 60' covered balcony. "Southern Views" location on the Fairmont Southampton Hotel grounds - the hotel reception is less than a two minute walk away - provides ready access to all the hotel's amenities including golf (Turtle Hill Golf Club, winner of Golf Digest's Best Places to Play Golf), tennis, hiking trails, Willowstream Spa, business center and five top-ranked restaurants offering some of the finest dining in Bermuda: Waterlot, Ocean Club, Bacci's, Newport Room Gastro Pub, Beach and Pool Terraces. Other amenities include a five minute walk to the Bermuda Railway Trail, which spans 18 miles of Bermuda- ideal for walking, biking, and scenic tours. Famous Gibbs Hill Lighthouse is also within walking distance and provides 360 views from its upper viewing station. Horseback riding and all all the magic of Spicelands Ridge and South Shore trails which include sunrise and sunset guided tours begin a mere 5 minute taxi ride or moped ride away. A cycle livery is also located on the campus if you choose to rent and ride a moped for your visit to Bermuda. A free hotel shuttle will take you to and from anywhere on campus including the beach if you choose not to walk. The rooms of Southern Views are large and spacious with beautiful water views and a fitness area to complete this rental property. This property is a dream location for your vacation!! 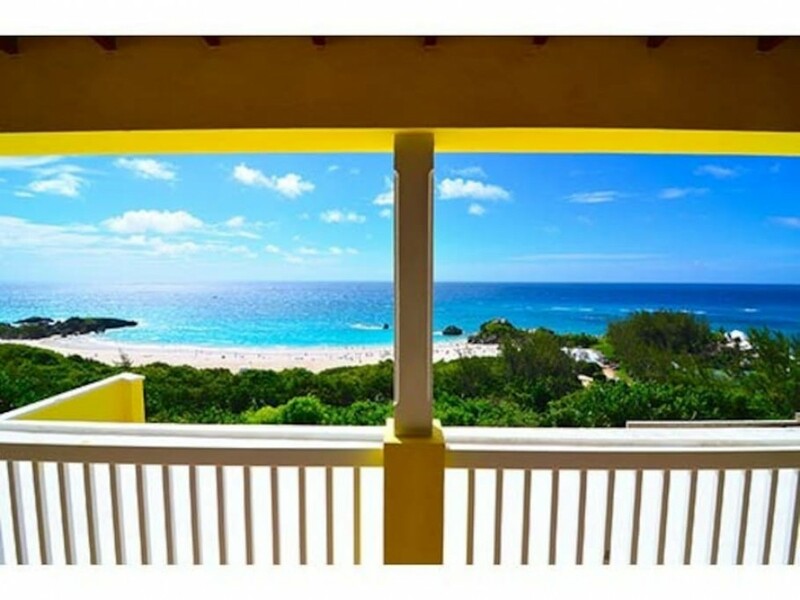 Southern Views is a private execeutive home located on the Fairmont Southampton Property with unparalled views of Horseshe Bay Beach voted the number one picture postcard beach in the world. Yours to enjoy form the deck of 15x72 and 15x35...and all windows in th elivinf space share the same view. It is an ideal location for a vacation with beach,tennis courts,golf course, spa and 5 hotel restuarnts on campus no need to go to far with all this at your doorstep. This beautiful executive home is located on the fairmont Hotel grounds overlooking world famous Horseshoe Beach. Walk down to the beach, tennis courts, golf course,spa and five hotel restaurants as well as three others in the area. The front door of the hotel is a stroll away. The railway trail is also accessed nearby and can be enjoyed for walking, running or biking. You will not want to leave "Southern Views"
Life on the veranda is a pleasure - roomy, comfortable, and capped by the glorious views. Kim was the perfect hostess and made sure that everything was in place to enjoy her wonderful home. Best location on the island with 75 foot covered terrace with expansive water views. Super clean! We introduced 114 of our best friends and family to Bermuda last week as we celebrated our son's wedding. My husband and I traveled to the island 37 years ago on our honeymoon trip. Southern Views is on the grounds of the Fairmont resort where we stayed at that time. The house is spectacular, Kim and Michael are the perfect hosts, the views of Horseshoe Bay beach are stunning. The location is perfect for dining at the resort restaurants and securing a cab or a shuttle to the beach. We loved every minute of our stay and the newlyweds are on Cloud 9!! Location and layout of the home is perfect for a large family gathering or a group of friends wanting to connect and spend time together, yet have private alone space. Each bedroom is comfortable and equipped with a private bath. The pool was wonderful and the patio was used by all every morning for coffee and every dinner. The kitchen is large enough to cook for eight +. Kim and Michael's hospitality was spot on. They made us feel welcome in their home, attentive to our needs while giving us ample privacy. To improve on perfect, suggest to improve wifi speed and better stock the kitchen cooking utensils. Other than that, this is a PERFECT spot to get away and enjoy Bermuda.